Players on PUBG mobile can now access a host of Mission: Impossible-themed content, after the battle royale shooter announced a month-long tie-in event throughout August. 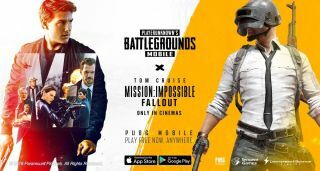 Mission Impossible: Fallout is the latest film in Tom Cruise’s bombastic action series, and seems an appropriate fit for the gritty gunplay of PUBG's free-for-all game mode, which sees 100 players duke it out to be the last one standing. The tie-in brings a number of new avatar skins and customizable parachutes, alongside in-game rewards and challenges centered around the action movie, which is currently playing in cinemas worldwide. Players can also set the game's background music to a riff on the Mission: Impossible soundtrack. PUBG boasts over 100 million players on mobile alone since launching in March, though its cartoonish battle royale rival Fortnite has gained significantly more traction across various gaming platforms – while the latter will also be coming to Android phones in the coming months. Fortnite players will fondly remember their own high-profile tie-in back in May, which let them roam the game’s island as intergalactic villain Thanos from Marvel’s blockbuster Infinity War. It doesn’t look like we can play as Tom Cruise’s character in PUBG – sadly – but any association with the action star is likely to help PUBG’s fortunes. The game’s general manager, Vincent Wang, has said we would see more tie-ins of this kind in the future as PUBG looks to expand its player base.